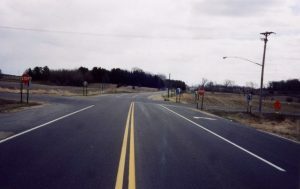 Roadway lighting provides greater intersection visibility of the intersection, signs, and markings. Rural roadway lighting (Hillary Isebrands et al./Institute for Transportation). Intersection crashes during nighttime hours may occur due to drivers being unable to see conflicting traffic or because the driver is unaware of the intersection until it is too late to avoid a collision. In rural areas, typically the only source of lighting is provided by vehicle headlights. Roadway lighting provides greater intersection visibility of the intersection, signs, and markings (Atkinson et al. 2014 and Neuman et al. 2003). Even when only a single light is used, lighting may also indicate an upcoming intersection and alert drivers to changing roadway conditions. Lighting is best for intersections with a high number of nighttime crashes. In particular, rear-end, right angle, and turning crashes may suggest that drivers are unaware of the intersection (Atkinson et al. 2014). As noted by Neuman et al. (2003), the keys to successful application of lighting are to identify sites where lack of lighting is a significant contributing factor to nighttime crashes and to develop an appropriate lighting system using AASHTO and the Illuminating Engineering Society of North America criteria. 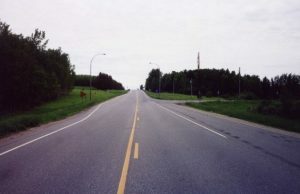 Roadway lighting at a rural intersection (Hillary Isebrands et al./Institute for Transportation). Chapter 6 of the Iowa DOT Traffic and Safety Manual discusses warrants for lighting (Iowa DOT 2014) and Chapter 11 of the Iowa Statewide Urban Design Standards (SUDAS 2014). A study in Iowa showed that the mean number of nighttime crashes at intersections with no lighting is two times higher than locations where lighting is present (Isebrands et al. 2010). As noted in the table below, a number of studies have been conducted that show the benefits of lighting at rural unsignalized intersections. Additional information is provided in this technical brief, Intersection Lighting (PDF). Summarizes countermeasures to address nighttime crashes at rural intersections, summarizes lighting. warrants and practices used by other states, and summarizes lighting warrants and practices used by other states. Green, Eric R., Kenneth R. Agent, Monica L. Barrett, and Jerry G. Pigman. Roadway Lighting and Driver Safety. Report KTC-03-12/SPR247-02-IF. Kentucky Transportation Center, University of Kentucky, 2003. Iowa DOT. “Chapter 6: Lighting. Iowa DOT.” Iowa DOT Traffic and Safety Manual. Iowa DOT, Office of Traffic and Safety, 2014. SUDAS. 2014. Iowa Statewide Urban Design Standards. www.iowasudas.org/manuals/manual.cfm?manual=design.